This book examines mass marketing techniques in a political rather than economic context. The authors' thesis remains persuasive: democratic politics, precisely because it requires mass support for its legitimation, increases the need for public opinion to be channelized and focused. This is precisely the task of marketing in the political process. Increasingly, advanced societies are involved in symbolic rather than direct forms of struggle. As a result, management of ideas becomes crucial to both political survival and economic expansion. 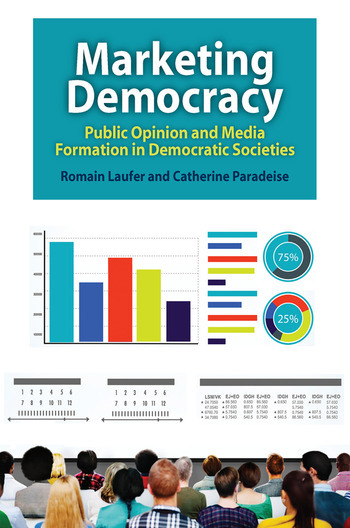 Romain Laufer and Catherine Paradeise argue that public opinion and media formation is built into the fabric of Western political culture, dating from the Sophists in ancient Greece through Machiavelli in the aristocratic baronies of pre-capitalist Europe. With the rise of the bureaucratic-administrative state in the West, the need for persuasive public opinion analysis became part of the fabric of the advanced Western democratic and capitalist nations. The volume benefits from authors trained and familiar with the traditions of both the United States and Europe. They are able to consider contrasts in marketing styles as well as continuities of contents among advanced nation-states. No simple "how-to" manual, this bracingly different volume discusses its subject with an easy command of the philosophical and cultural literatures, as well as the major classics of economics, sociology, and political science.